Now I am become death, the destroyer of worlds. J. Robert Oppenheimer’s quote from the Bhagavad Gita captures the real meaning of the bombing of Hiroshima and its pivotal role in history. At 08:15 local time on August 6 in 1945, an American B-29 bomber, the Enola Gay, opened her bomb bay doors and dropped ‘Little Boy’ onto the Japanese city of Hiroshima. Exactly 44.4 seconds later, it detonated over the medieval city, in a cataclysmic, blinding flash, with a fireball hotter than the surface of the sun. The radioactive blast levelled the heart of Hiroshima, followed by a powerful heat and pressure wave. It created a gigantic conflagration that literally incinerated the heart of the city. Almost 70,000 people were instantly killed in Hiroshima, with many more succumbing to radiation and other injuries eventually. 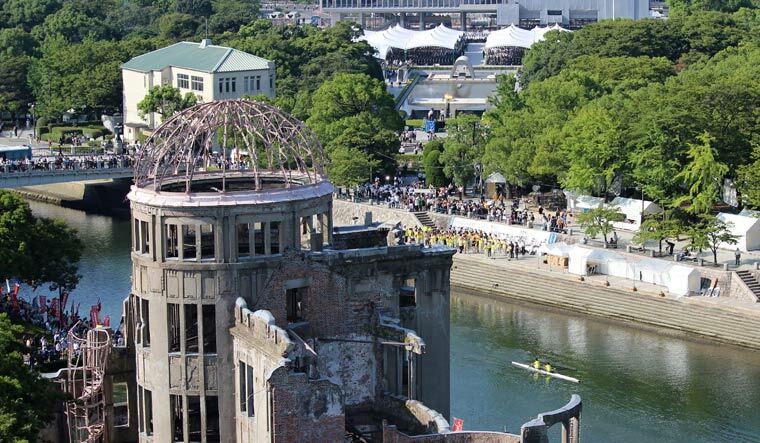 In a single, long moment, when the clock of history stood still, the shock waves from the nuclear bomb at Hiroshima had hurtled mankind into the nuclear age. We are the fearing children and the trembling grandchildren of that age, and our injurious times will subsist for decades to come. ‘Little Boy’ had bequeathed onto humanity his due inheritance of collective mortality. The glowing mushroom cloud looming over the ashes of a ruined Hiroshima is now the face of Armageddon. Monday marks the 73rd anniversary of that fateful, epochal event at Hiroshima. Contrary to popular belief, the nuclear bombing of Hiroshima and Nagasaki(August 9, 1945) were not the most horrific acts of destruction in warfare. Since mid-1944, the Americans had been systematically subjecting Japanese cities to strategic bombing and later firebombing using napalm. On March 10, 1945, the American firebombing of Tokyo is estimated to have killed a 100,000 people and rendered a million more homeless, burning to the ground vast swathes of the Japanese capital. The physical destruction and sheer loss of life, as the official US Air Force history noted, exceeded that of any great conflagration of the western world. In all, more than 63 Japanese cities were subjected to ferocious incendiary attacks, killing at least 300,000 Japanese civilians. Industrial production sharply declined and the dislocation in major urban areas was almost total. Millions were left homeless and industrial Japan all but lay in smouldering ruins. This was the level of damage that could be wreaked with conventional explosives. No, it wasn’t in the arithmetic of death and destruction that Hiroshima and Nagasaki stood out. It lay in what nuclear weapons portended. For the first time in human history, the instant release of the colossal energy that lies latent in a atom's nucleus was available to man and it could be applied in the field of warfare. Chemical explosives had provided the firepower for armies since the beginning of the modern age in the form of firearms, artillery, bombs, torpedoes and other weapons. As Europe industrialised and the power of the state to mobilise resources multiplied several fold, the operant capacity to wage war and kill, maim and devastate increased in multiples in a few short decades. This was manifest not just in the number of bullets, bombs and shells that a nation could lob at the enemy, but also in the capacity to marshal, supply and transport armies and air and naval fleets of unprecedented size to the far corners of the globe. Indeed, the final victory in the First and Second World Wars was decided by the overwhelming industrial superiority of the winning coalitions. This was a truism that Allied leaders understood well. When the US entered the Second World War after the Pearl Harbour attack, a beleaguered Winston Churchill confidently pronounced, Hitler's fate was sealed. Mussolini's fate was sealed. As for the Japanese, they would be ground to a powder. All the rest was merely the proper application of overwhelming force. The introduction of nuclear weapons at Hiroshima foundered that truism of victory: “the proper application of overwhelming force”. The first to offer a glimpse of this menacing, uncertain future was H.G. Wells, a seer of science. In his 1914 novel, A World Set Free, Wells grasps the essence of the new power and its deadly consequences. Wells imagines that the atomic bomb induces a blazing continual explosion that is never entirely exhausted, so that to this day, the battlefields and bomb fields of that frantic time in human history are sprinkled with radiant matter. It is the economic, portable capacity to retail apocalyptic destruction by a small band of men that made the nuclear weapon so epochal. The pendulum of victory would no longer be decided by who commanded the greatest numbers. In fact, there was no longer a possibility of a decisive triumph in a conventional-military sense. All that stared at contestants in a future nuclear conflict was a kaleidoscope of mini-Armageddons. The concept of ‘victory’ itself became a phantasmal, mirage-like thing. Henceforth, no rational political leader could wage war, with certainty of outcomes in mind. This paradigm shift in power relations has upended normal state-to-state relations. In geopolitical terms, the spread of nuclear weapons, along with the means to deliver them, has transformed Asia’s relations with the industrially advanced West. The latest evidence of this is the recent trajectory in North Korea’s relations with the US. The 'Hermit Kingdom' is essentially a penal colony of starving peasants, controlled by an Asian Gestapo. North Korea's GDP is a mere $28. 5 billion, which is smaller than that of Akron, Ohio, but about the same size of Kanpur, Uttar Pradesh. Yet with a mere half a dozen small nukes, an Asian strongman like Kim Jong-un was able to bring Uncle Sam to a summit. The equivalence is that of a paramount leader of China agreeing to a summit meeting with the panchayat president of a large Indian village! Paradoxically, of course, nuclear weapons have also stabilised the world, rendered infeasible great power conflict and retrained armed violence. The 20th Century is the bloodiest century in history, with an estimated 187 million dying because of war. Yet an overwhelming majority of deaths occurred prior to 1945. Since then, wars have been reduced in time, space and mortality and the number of causalities from them continues to taper off. Oppenheimer, the organising genius of the Manhattan Project that created the first nuclear bombs, riddled the right message from the mushroom cloud over Hiroshima. He said, It did not take atomic weapons to make man want peace. But the atomic bomb was the turn of the screw. The atomic bomb made the prospect of future war unendurable. It has led us up those last few steps to the mountain pass; and beyond there is a different country. We are now in that different country and must grapple with that reality. Sankar Ramachandran is an independent journalist.